I had read that Peggy's Cove lighthouse is the most photographed lighthouse in Canada, so I was really excited when I found that an excursion to Peggy's Cove was one of the choices on our fall cruise. 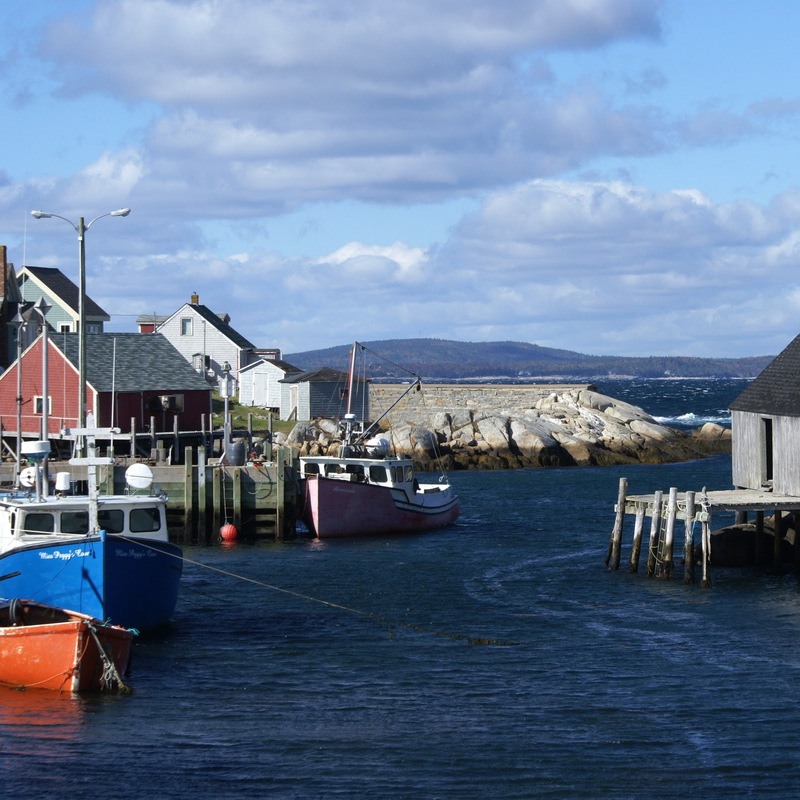 Peggy's Cove is located in Nova Scotia just 35 miles from the port at Halifax. On the day we arrived in Peggy's Cove the weather was perfect for photographing. There was a beautiful blue sky with just a few puffy white clouds which made a perfect backdrop for the lighthouse photos. Peggy's Cove lighthouse is an octagonal lighthouse of reinforced concreted that is painted red and white. It is very striking against the bare granite boulders that are everywhere in this region. The current lighthouse was built in 1914 and stands 50 feet high. 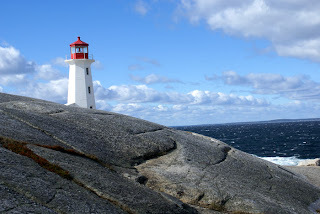 The lighthouse is located in the small fishing village of Peggy's Cove. The village itself is often photographed and is very picturesque. The photo above is shot from a wooden bridge across the roadway. I have written a page on my visit to Peggy's Cove and I hope you will stop by for a visit at Peggy's Cove On this page I share several of my photographs. Our cruise also had a stop in Quebec City and I found it to be a wonderful city to tour and photograph. You may read more about it here at Quebec City. I hope to someday return to Nova Scotia and take more photographs. When I was on the tour bus I kept seeing wonderful little coves and lots of lighthouses. I would have loved to be able to stop and take more photographs, a moving bus makes it hard to get good photos. 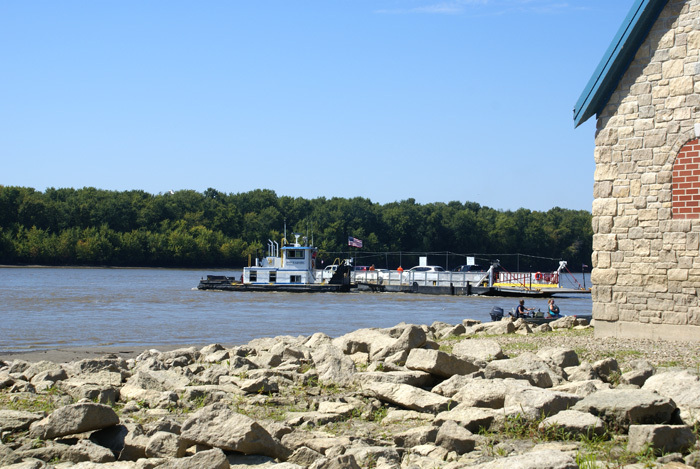 Grafton, Illinois is a wonderful river town located at the confluence of the Mississippi and Illinois rivers. It is only a short drive up the Great River Road from St. Louis. On a beautiful September afternoon we took the drive from St. Louis to Grafton. I had heard there was a lighthouse at the port of Grafton and I was anxious to photograph it. The lighthouse, as I found out, is not a working lighthouse but rather a faux lighthouse that was dedicated in 2007 to celebrate Grafton's recovery from the great flood of 1993. The lighthouse is quite picturesque and I was able to photograph it from several angles. While in Grafton we discovered it was a delightful river town with lots of activities to fill a late summer afternoon. We had a nice lunch at the Marina and were able to watch the Grafton ferry as it made it's way across the river to St.Charles county in Missouri. We also found several wineries in Grafton and beautiful scenery at nearby Pere Marquette Park. For more of my photos from our visit stop by my lens at Grafton, Illinois. The lighthouses along the eastern coast of the US have always intrigued me. I have seen many of the mid Atlantic and southern lighthouses but have only seen a few of the ones on the northeastern coast. I hope to visit several this fall and will bring you some of my photographs then, but in the meantime, I received this great article from the Maryland Board of Tourism that I thought I would share with my readers. I showed the article to my husband and he said "Looks like our next road trip". Well we do have plans for this fall, but maybe next spring I will make it there. 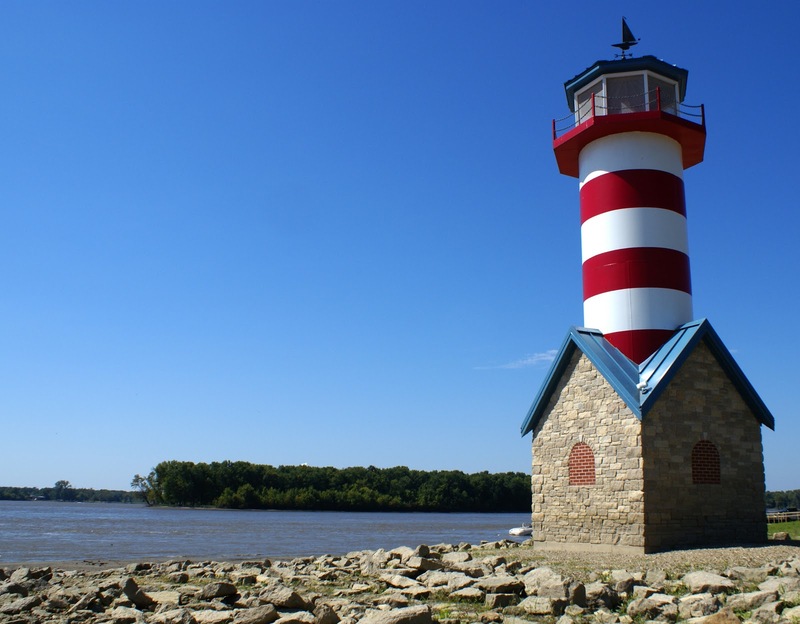 It looks like there are lots of great lighthouses to visit...the one at Concord Point is the oldest continuously operating lighthouse in Maryland. Thanks to the Maryland Tourism board for this great article. BALTIMORE ( Sept. 10 ) – Follow the lighthouses. Explore the Chesapeake Bay and the towns and attractions that line its shores, says Maryland's Office of Tourism, and you'll discover authentic Maryland experiences along the way. Tourism officials have designated September as a time to focus on the two-dozen lighthouses in Maryland, making them the theme of its Maryland Spotlight campaign – a monthly promotion that highlights distinctive aspects of tourism in the state. "Our lighthouses have cultural, historical and architectural value," says Gov. Martin O'Malley. "These 'beacons on the bay' are iconic structures that reflect Maryland's maritime heritage while evoking a storied past." The first lighthouse in Maryland was erected in 1822, and the last in 1910. Most of the 44 lighthouses built in that span were constructed from the mid- to late 1800s. Early on, lighthouses were land-based, usually stone or brick towers. Concord, Cove Point, Poole's Island and Piney Point are some examples. Dwellings for lightkeepers were built near each light. John Donahoo, a Havre de Grace businessman who held public office, was Maryland's prolific lighthouse builder at this time. He built a dozen of these masonry towers, including the ones just mentioned. Screw-pile lighthouses came later. They tended to be multi-room, hexagonal structures or cottages that sat atop wrought-iron piles screwed into the bottom of the bay. A lantern was placed above each of these structures. Only four of screw-pile lights have survived the rigors of the bay:Drum Point, Hooper Strait, Seven Foot Knoll and Thomas Point Shoal. By the 1870s, lighthouses were built with caissons, cylindrical bases sunk deeply into the bottom of the bay and filled with concrete. A tower or cupola would be placed atop the caisson. TheCraighill Channel Range Front Light was the first caisson-style light built in the U.S. Among the surviving caisson lights on the bay are: Bloody Point Bar, Sharps Island and Solomons Lump. After 1910, automated lights began to phase out the necessity for lighthouse keepers. 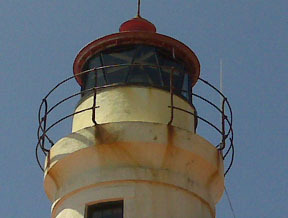 The Coast Guard, starting in the 1960s, dismantled many of the lighthouses and replaced them with small, automatic beacons. "The lighthouses that still stand – some completely restored with period décor and exhibits – are unique artifacts of a different era," says Margot Amelia, executive director of the Maryland Office of Tourism. "They have a certain mystique to travelers. Some you can visit in person. 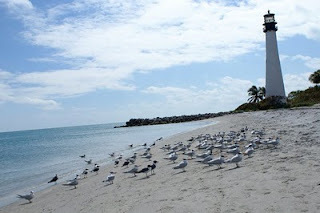 Others you can view from the water when you take a charter-boat lighthouse tour." Amelia also says: "Lighthouses present opportunities for getting to know the diverse nature of destinations along the bay – even in the same area." Lighthouse locations in Southern Maryland, for instance, have varied elements of appeal. Blackistone Light is on St. Clement's Island, immersed in history, in St. Mary's County – where English settlers first landed 376 years ago aboard the Ark and the Dove . Cove Point Light, at the southern tip of the Calvert County peninsula, is a natural starting or ending point for the county's Patuxent Wine Trail. Many of Maryland's lighthouses are associated with the Chesapeake Bay Getways Network, which connects the bay and its rivers and more than 160 parks, museums, communities and trails with residents and visitors to this region. Concord Point Light, Havre de Grace (Harford County) – Located at one end of a waterfront promenade overlooking the juncture of the Susquehanna River and Chesapeake Bay, this is the oldest Maryland lighthouse open to the public. It's the second oldest in Maryland, built in 1827, and similar in construction to the 1825 lighthouse at Pooles Island, which is off-limits. Both are granite towers (painted white) with mahogany doors. The restored keeper's dwelling is 200 feet from the lighthouse. The first keeper was John O'Neill, a local War of 1812 hero. Havre de Grace Maritime Museum and Havre de Grace Decoy Museum are nearby. Drum Point Light, Solomons (Calvert County) – This completely restored lighthouse, in operation from 1883 to 1962, is part of the Calvert Marine Museum . Drum Point is a 1.5-story white, hexagonal screw-pile cottage. When built, it had a light that could be seen for 11 nautical miles and a 1,400-pound fog bell. It originally stood in 10 feet of water at the northern approach to the Patuxent River. By 1900, the water level depth reduced to three feet. Drum Point stood on dry land by the time it was decommissioned. The museum offers regular tours of the lighthouse. Hooper Strait Light, St. Michael's (Talbot County) – Now part of the Chesapeake Bay Maritime Museum overlooking the Miles River, this screw-pile lighthouse was headed for demolition in 1966 when the museum interceded. The lighthouse, which includes a hexagonal dwelling, was built in 1879. It was installed at Hooper Strait, a passageway connecting the Chesapeake Bay and Tangier Sound, about 40 miles south of its present location. Groups can spend a night at the lighthouse and experience the lifestyle and duties of a 19th-century lighthouse keeper. Seven Foot Knoll Light, Inner Harbor, Baltimore – Built in 1855 from prefabricated parts, this screw-pile lighthouse was installed at the mouth of the Patapsco River. The original octagonal structure was upgraded in or around 1875 with a round dwelling unit, 40 feet in diameter, encircled by a gallery deck. A number of lighthouse keepers lived here with their families during the 133 years that it was manned. After a simple steel tower replaced the lighthouse in the 1980s, Baltimore City acquired the lighthouse and restored it with interior exhibits. Seven Foot Knoll is now part of Historic Ships in Baltimore's maritime collection. Thomas Point Shoal Light, near Annapolis (Anne Arundel County) – This Maryland icon, one of the most recognized lights along the Chesapeake Bay, is also one of only 10 lighthouses in the U.S. to be designated a National Historic Landmark. Tours of Thomas Point depart from the Annapolis Maritime Museum. 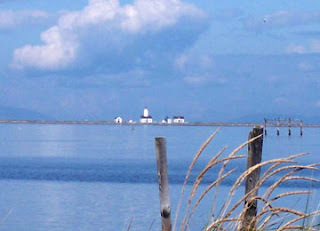 The hexagonal, screw-pile structure, built in 1875, stands just north of the South River, south of Annapolis – the sole screw-pile light on the bay still in its original location. It was built to withstand the fields of moving ice that had severely damaged other screw-pile lights on the bay. The first two lighthouses at Thomas Point were on-shore towers that succumbed to erosion. For more information about lighthouses in Maryland, visit the U.S. Lighthouse Society's Chesapeake Chapter online or the Chesapeake Bay Getways Network. In August, the tourism office highlighted opportunities for outdoor adventure in Maryland. Previous themes have focused on: buying local; prominent gardens; bed and breakfasts; Maryland's Main Streets; Chesapeake Bay art; hiking and biking trails; and Maryland wine. To receive free Maryland travel information - Destination Maryland, Maryland Calendar of Eventsand a state highway map - by mail, call 800-719-5900. Information can also be found on the Tourism Office's web site, VisitMaryland.org. Hello and thanks, Mary Beth, for having me back as part of my September blog tour! Last time I was here I brought photos of some California lighthouses to share. I've just returned from a visit to Washington State, where I visited some more wonderful beacons. The first day out, my brother and I drove from his home in Port Townsend to the town of Sequim. Here, we took various roads north to find the way out to New Dungeness Lighthouse. It was chilly and blustery, and neither of us was really up to the 5 mile walk out on the spit so we stood and stared at the small white spot. Here is a photo my brother took, so you can see how far it is out there. Maybe next time I'll make the trek! Optionally, I understand you can kayak out there as part of an organized group. From there we went to Marrowstone Island, just across the water from Port Townsend, and hunted down the lighthouse there. Marrowstone Light was nothing like we expected; we came away calling it "the Night Light" due to its less-than-stellar bulb. But it was in a lovely beach setting and we enjoyed the walk. Here is the light and the keeper's house, now part of Fort Flagler State Park. On the last day of my visit, we detoured through Hansville on the way to the airport and found the not-so-well-marked Point No Point Lighthouse. This is a real beauty! Still installed is the 4th order Fresnel lens. Not open on the day we visited, but the U.S. Lighthouse Society maintains an office inside one-half of the keeper's dwelling and they were delightful folks who love lighthouse seekers (of course.) 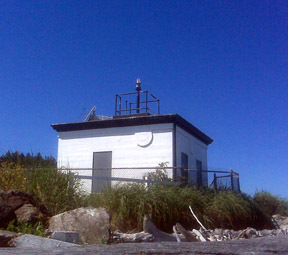 This little beacon, the oldest in Puget Sound, is in excellent condition, well worth the drive over Kitsap Peninsula. By the way, you can rent the other half of the dwelling! 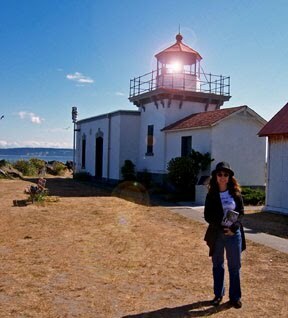 Point Wilson Lighthouse is located right in Port Townsend (and sometimes mistakenly called Port Townsend Lighthouse.) It's a classic tower and still in active operation. It wasn't open during the days I was in town, so will try again next time. 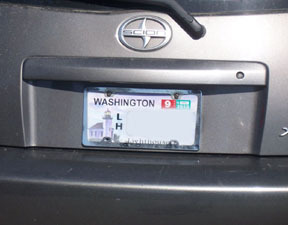 For fun, here is a shot of a Washington State Lighthouse vanity license plate. If we had these in California, I'd surely have one! Reminder: To celebrate the release of CAPE SEDUCTION, I'm holding a contest! All you have to do is read the CAPE SEDUCTION excerpt and leave me a relative comment--you'll be in the drawing for FIVE Echelon Press eBooks of your choice, downloaded onto a really cool 2GB flash drive! (Or a $25 gift card to B&N, your choice.) Drawing will be on my last blog tour stop, which is tomorrow, 9/10/10. See schedule at my website! Pam Ripling, who also writes as Anne Carter, is a self-proclaimed Lighthouse Nut and the author of Beacon Street Mysteries CAPE SEDUCTION and POINT SURRENDER, in paperback or for your Kindle; also for your nook, iPhone, Sony eReader and other formats at Omnilit. Visit Pam/Anne at Beacon Street Books. I have always been fascinated by lighthouses and have photographed over 30 in the past four years, but I had never climbed all the way to the top of the lighthouse. During a trip to Beaufort, South Carolina we decided to take a side trip to Hunting Island to see the lighthouse at Hunting Island State Park. I was with friends who decided to climb the lighthouse and I decided this was my chance, I would overcome my fear and make the climb. 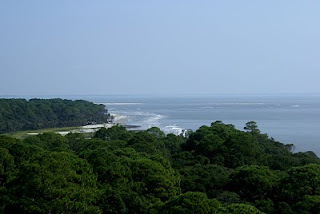 I found the lighthouse at Hunting Island to be rather easy to climb. Although it had 167 steps, they were made of sturdy iron with a really good railing. There was also a landing after each 19 steps so I could easily catch my breath before proceeding. I was doing really well till I got to the very last steps. At these last steps the railing stopped for the last few steps and I panicked momentarily. I think I held my breath, gripped the wall and pushed myself up the last steps. Now I was at the top landing before going out on the gallery. The gallery of the lighthouse is a railed in area surrounding the light that the lighthouse keeper used when cleaning the outside of the light. 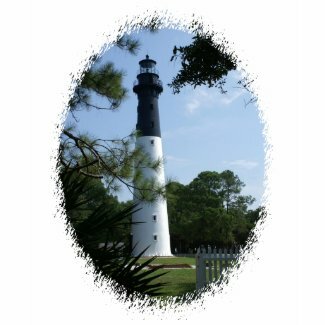 For visitors it is a wonderful way to see the view from the lighthouse. One of my friends walked out into the gallery and I decided I would follow, but just a few steps. However, after seeing I could make it that far, I gained my courage and proceeded around the entire area of the lighthouse. I even stopped to take photographs in each direction. The view was breathtaking. I felt very proud of myself, and next time I visit a lighthouse where it is possible to climb, I'm sure I'll make the climb again! .View from the top of the lighthouse facing north. 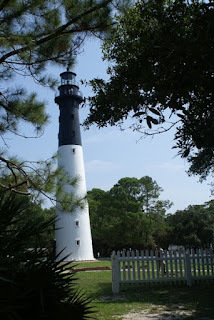 In honor of National Lighthouse Day- August 7th, I am honored to have an article by Pam Ripling a self pro-claimed Lighthouse Nut and the author of two wonderful lighthouse mysteries. 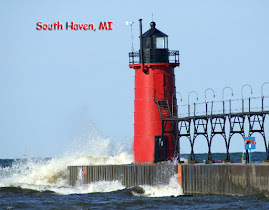 Pam writes about west coast lighthouses and I am sure you will enjoy hearing about these lighthouses that she has visited and viewing her photographs. Thank you Pam for your article and I look forward to having you as a frequent guest blogger! No one can dispute that the East and West Coasts vary greatly in their terrain. Overall, it would be safe to say the West has an edge on rocky cliffs, while the East flattens out nicely in more areas. Still, both shores warrant protection! beautiful beacons here on the Pacific coast. Here are a few I'd like to share with you. abound. For more information, visit their site: http://www.palosverdes.com/pvlight/. This is a delightful "little" lighthouse located in Crescent City, California. Big on tourist attention, the volunteer "keepers" give tours of this light station built right into the center of the home. The lighthouse sits on a tiny islet at the northernmost point of the harbor, and is water-locked during high tide. This requires visitors to pay attention to the tidal charts or risk being stranded! buildings, inside and out. More at Point Cabrillo.Org! Next time I visit, I'll be talking about a pair of truly unique, off-shore California lighthouses! and other formats at Omnilit. 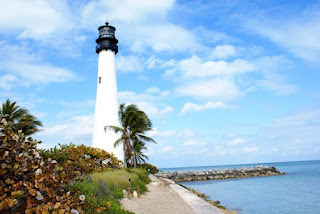 I thoroughly enjoyed my photographic session at Cape Florida lighthouse. 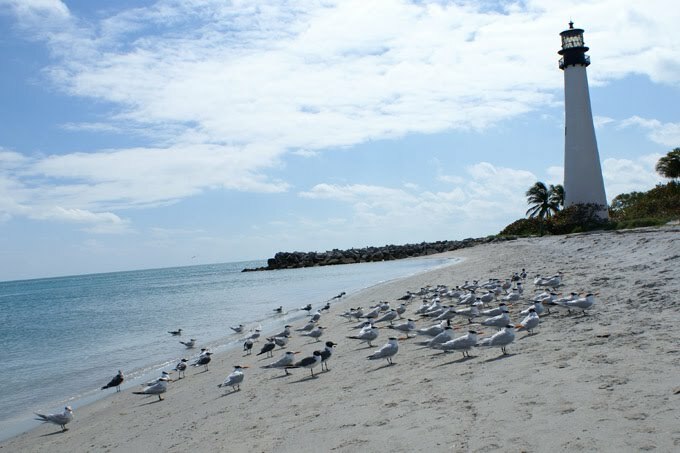 This lighthouse is located at the southern tip of Key Biscayne, Florida and is very accessible to the public. I was able to capture it from the beach and from the lighthouse grounds.